I was recently reminded of this incident that happened a few months ago. I met this person who was recommended an ILP by her agent. The agent went as far as to use skewed calculation and fuzzy Maths to show her that the ILP was much better than a term policy. Feeling uncomfortable about the recommendation, she sought a second opinion and that was how I came about to give her some advice. Remarkably, after I spent about three long sessions explaining to her the superiority of alternative solutions such as “buy term invest the rest” (BTIR), she chose to implement that strategy through the same agent who tried to rip her off with a more than $5,000 a year regular premium ILP! It turns out that the agent could sense that she could not possibly sell the ILP any more and changed her tune to what I was educating the client on, and closed the sale! I am still very impressed with the agent’s stellar salesmanship! She deserves the sale as she had practised and employed just about every insurance sales technique in the book, and managed to close the sale despite her blatant attempt at trying to push a lousy product in the first place. I fully concede defeat as I focus on honing my financial planning skills, not my sales techniques. As for the person, while she did not pay a single cent for my financial advice, I can foresee her paying dearly for her own decision. The agent does not know anything about portfolio construction which is very evident from the funds she had selected in the ILP she initially recommended. The person in question was at best a person of balanced to slightly higher risk tolerance, and she was recommended a portfolio of 96% equities in seemingly randomly picked funds! Why an arbitrary and mere 4% in fixed income? Why not even 0%? I suspect with good reason that the recommendation was entirely random! Till date I still find it quite amusing and I wish I could just put the fund recommendation here to share the hilarity with the more investment savvy. Probably not as funny for the client who isn’t. Good luck with a “buy term invest the rest” strategy with someone who has been making her living erroneously saying that ILP is better than BTIR, and treating your investment monies like she is having fun in RWS. Furthermore, there is an essential component of the insurance portfolio which I happen to have studied quite extensively on. From understanding her circumstances through our discussions and my knowledge of the specific terms and conditions of this particular component – I can predict that she is very likely to run into trouble when a claim arises. Come to think of it, I did not have a chance to elaborate on these two major danger signs to her. Even if she reads this post now, I think it is a bit too late as she might have already been financially committed. For me, I only care about my clients’ interests and since she has decided to take my recommendation and place business with the agent despite the latter attempting to shortchange her before, I informed her that I was discharging my obligations as a financial planner to her and hence she is not my client. I really did mean to blog about this earlier, but I was busy helping my other clients who actually appreciate my efforts. Those who understand my motivations do business with me without me resorting to sales techniques. Regardless, I doubt it would make a difference anyway. 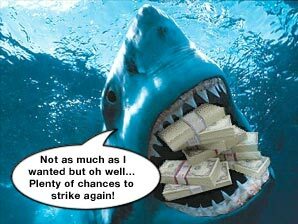 Some people are really willing to be fed to the sharks. Business is still booming for people who call themselves financial consultants and peddle financial products outside shopping malls and bus interchanges. Some are a lot more subtle and sophisticated, packaging their high-commission-low-benefit products as “financial planning”. What happens a few years down the road? In reality, an agent who is used to the fat commissions of a big ILP will probably do two things: ignore low revenue clients like her as the time can be spent selling more ILPs, or attempt to push more dubious products to her. A hungry shark who is unable to bite off an entire arm will be happy to settle for a hand first, and then go for the other limbs given the chance. In any case, her needs will change over time and she will require continual advice. Who is she going to seek advice from? Her not-so-trustworthy agent? Another ethical financial planner perhaps? I’m not saying that I’m the only ethical planner around, but I do feel that I have very unique financial and personal circumstances to continue doing what I do. The remaining ones have either moved on to high networth individuals, businesses and corporations, or have dropped out from the industry since people are more willing to do business with sharks. I can only do so much. I cannot help people who refuse to help me help them, nor help themselves in the first place. I do not mind losing sales as I am very clear that my job is not about sales. To me, such incidents are at worst a loss of remuneration (which in this case is quite a small absolute amount) and at best a learning experience. To such people, the potential financial repercussion is so tremendous, I ironically feel bad for them instead of for myself. Please stop feeding yourselves to sharks.